This is going to be a rather short, and to the point podcast today. That’s because there are only a few super serious things you need to focus on as a site owner from now until the end of the year. And, because I took off part of yesterday for the eclipse!!! I live in a prime viewing zone and wow!!!! It was an amazing event to witness. I video recorded some of it and you can see that on my personal YouTube channel. I want to remind everyone, especially my Webmaster Training members about the live webinar on Thu, Aug 24 at 1pm ET for cPanels in WHM Hosting Accounts. 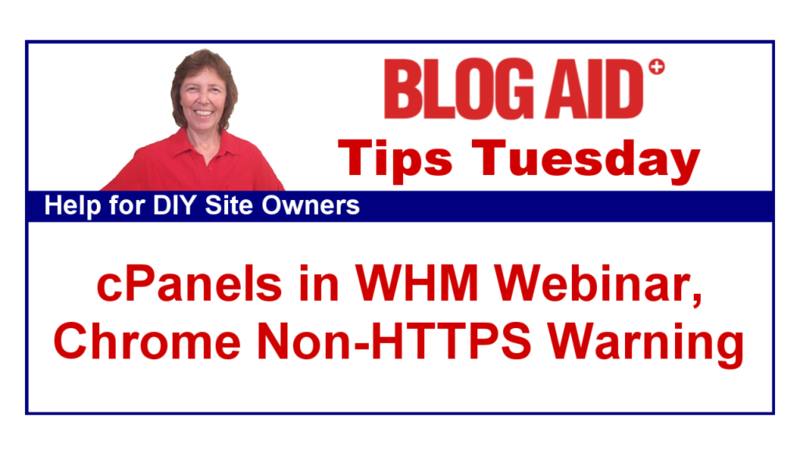 This is the 2nd of 3 webinars in the WHM Hosting series. A WHM account is a must-have now for anyone with multiple sites including designers and trainers that need to set up temporary sites for client projects. So, do be sure to join in live. Quick reminder for all those who attended the first WHM Tour Webinar that access to the replay ends on Thursday for non Webmaster Training members. So, do be sure to watch it again to learn more about why you need a WHM Account for your multiple sites. So, look for that post. The huge news this past week was Google announcing that starting in October, the Chrome browser will show a big honking NOT SECURE warning for any non HTTPS site that is collecting any type of data. That’s going to pop just about every site owner I know! This is the 2nd such penalty Google has issued for non HTTPS sites this year. The first was back in February for any sites taking passwords, like member sites. You have likely noticed new browser warnings for that on your WordPress login page too. There are the duct tape and chicken wire ways to make your site HTTPS, and many of them are free and offered by your host. If it worked, I’d do it for myself and my clients. Your site is not actually converted to HTTPS all the way through. You may get a green padlock only because some elements are being blocked by the browser. And you’re missing all of your security headers, including the one required to get on the Chrome safe site preload list that every other browser copies with Google’s blessing. None of your 3rd party accounts are properly updated, like Google Analytics, Search Console, or social media. Read my post on the Top 10 Reasons NOT to do Free HTTPS Conversion for more details. That myth is #3 in the Top 7 Myths About HTTPS Site Conversion. That leaves your site open to man-in-the-middle attacks because CloudFlare is using an unencrypted port to pick up your site files from your host. Does Your Host Offer Free SSL Certificates Yet? Some site owners are going to be in for a very rude awakening when they discover their host doesn’t even offer free SSL certificates likes Let’s Encrypt. Insult to injury will be discovering they still have more than 6 months left on their term with that host and it’s too expensive to leave. There is a temporary way around this, just to get you through this October penalty. I’m researching the rumor that folks are losing their Pinterest share counts when they flip to HTTPS. None of my clients are losing their counts, so I don’t know where this is coming from or what’s behind it. Goofed something in the share count recovery if using a plugin like Social Warfare. Social Warfare had an update a few days ago that didn’t go well and their site has been down. So I’ll be looking into their docs on it as soon as that issue is fixed. Isn’t this the 4th time they’ve completely rebuilt that plugin? It truly boggles my mind how many millions of site owners have not heard that they need to switch to PHP 7 and get their sites converted to HTTPS now. I’m asking you to help spread the word. Tell those folks about it. Help me dispel the rumors and myths and misinformation. There is so much misinformation out there about converting to HTTPS and people who are not into the technical aspect just don’t understand. Keep doing these posts about it so we can share in the hopes it will help the non- techies like me. Thanks Debra!!! And I appreciate you sharing and helping folks make educated decisions on more than price, especially when some things are being offered as free. I dont understand what is wrong with the free version. My host (Site5 ) just informed me the free version is fine we need to be told the difference. I already have the PHP7 and the MySQL 5,6 what more do I need, In fact I could probably install the certificate my self as I have a CPanel also its just a matter of creating a file to place it in and/or just using the htacess file isnt it? Here are 10 reasons not to go the free route that explains more. Please see Level 3 of the Webmaster Training for what it takes to do a full conversion instead of the duct tape / chicken wire way that most hosts do it. They don’t actually convert your site to https.